The first time I was introduced to a papillon puppy it was love at first sight. This little ball of fluff was about the size of a four week old kitten. As he sat in my cupped hands my heart melted and I immediately dubbed him "The Little Gizmo". We had always had a family dog, but these had been mutts. The idea of owning a pedigree, especially a breed I had never heard of before, was a bit intimidating. As it turned out, bringing a "pap" home turned out to be both a challenge and a delight. The first thing I did was to find out as much as I could about the breed. 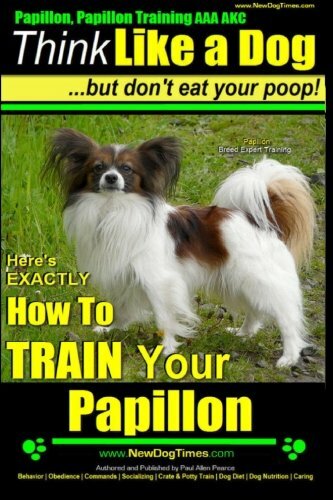 The papillon has a fascinating history. These little dogs were developed from the continental toy spaniel, a popular lap dog for European aristocrats for hundreds of years. Toy spaniels have appeared in paintings since the thirteenth century and can be seen in the works of many old masters including Titian, Murillo, Goya, Van Dyck and Rubens. Queen Marie Antoinette had a small, erect-eared dog which she called her chien papillon or butterfly dog. Legend has it that when she was beheaded during the French Revolution her little dog accompanied her to the guillotine. It is also said that a building in Paris named the Papillon House is where this dog was cared for after the death of its mistress. As a puppy, Gizmo had stubby legs, a flattish nose and small ears and was evenly covered with a coat of short fur. But as he grew an amazing transformation took place. He developed a pointed nose, elegantly long legs and a silky coat. Adult papillons are small toy dogs which measure no more than 12 inches at the shoulder. While the coat over their body is of medium length, they have fringes of hair on their hind legs which are known as culottes and their tail hair cascades down in a long, extravagant plume. It is their ears, however, which make them truly unique. Their small heads support large, erect ears with long fringes of hair which look like butterfly wings (papillon is French for butterfly). Papillons have white fur with a dark head and ears, ideally with a white blaze down their foreheads, and dark patches on their bodies. Gizmo was black and white, but paps can be any shade or mixture of shades including lemon, tan, red, sable and black. One variety looks more like a miniature spaniel because it has ears which hang down. This type is called a phalene, which is French for moth. Gizmo was extremely bright and sometimes seemed to know instinctively what we were going to do or say. So I was not surprised to discover that papillons are considered to be the eighth or ninth smartest breed, right behind large working dogs like border collies, German shepherds and golden retrievers. I also frequently joked that Gizzy should have been called Napoleon because he was a small Frenchman with delusions of grandeur. Our next door neighbors had two retrievers, and it was quite hilarious to watch Gizmo establish his position as the alpha male and lord it over a young retriever five times his size. Gizmo was an extremely sociable little guy, which had both pluses and minuses. He loved being with people. He was very friendly with both people and other dogs, although we did have to watch him around small children because he would nip if they were rough or if he got tired. He also got miserable if left alone. He had a dog bed, but preferred sleeping on the bed with mum and dad, and we never managed to crate train him successfully because he whined inconsolably as soon as he could not see us. Giz was also an unstoppable bundle of energy who got bored very easily. This made him both a joy and a challenge. As a puppy he was always getting into trouble. He was also incredibly difficult to house train. He had a tendency to mark inside the house, and it was difficult to catch him because he ran like a streak of lightning. He was also delightfully playful and loved to chase balls and to learn tricks like jumping through a hoop. This made him a natural at dog agility. He loved playing on all the different agility equipment. He was an extremely fast learner, and loved to jump and run. Because he was so fast he could always get good course times, as long as he stayed focused and did not get distracted by stray cats or familiar faces in the audience. Also, because he was a highly sociable little boy he just lapped up all the attention he got at agility trials. Papillons are generally healthy and hardy. Gizmo was happy playing in both hot and cold weather, even tunneling through snow without a care in the world. And he never gained weight, probably because he energetically burnt off excess calories. However, there are some health problems associated with the breed. A common genetic problem is luxating patellas or loose kneecaps. This causes the kneecap to slide out of position, which causes inflammation and lameness. Another less common genetic issue is progressive retinal atrophy (PRA), which leads to blindness. Fortunately, Gizmo did not have either of these genetic problems, but he did suffer from another condition which was quite frightening the first time it happened. When he overexerted himself on the agility course he experienced spasms in his windpipe. This is referred to as reverse sneezing or hurffing, and sounds like a gagging cough or a wheezing, asthmatic exhalation. The best way to stop the spasms was to gently massage his throat until his breathing became normal again. It also helped to blow gently into his nostrils. As Gizmo got older he began to lose his teeth. We did not know this at the time but the teeth in the papillon's small jaw have very shallow roots, so their teeth become loose easily, and fall out if their gums become inflamed. So Gizmo got a regular teeth brushing with a special canine toothpaste to prevent the build up of tartar which could lead to more inflammation. As a general rule of thumb, small dogs live longer than larger breeds, and papillons are not as susceptible to cancer as other breeds. We therefore expected that we would have our little Gizmo around for 15 to 20 years. However, the average life expectancy for papillons is 13-15 years, and we lost Gizmo at 12 years old because of heart failure. Heart problems are not common with this breed, but congestive heart failure is a common cause of death in older dogs. Papillons are generally quite low maintenance. They do not need to be clipped or groomed at the beauty salon. All they need is a regular light brushing. Their tails, however, do need some extra attention as their long, draping tail hair tends matte easily and to catch burrs, grass and twigs. Also, their bones are quite delicate so even though they like children they should not be subjected to any rough housing. Papillons are indoor dogs that have been bred to enjoy being around people, and their small size makes them perfect for people who live in an apartment or small house. However, because they are sociable little beings, they will be miserable if left home along for long periods of time. Also, because of their intelligence and high energy levels they crave attention and need their people to play with them regularly. I had not heard of this breed until now. You did a wonderful job keeping this balanced by putting in the health issues that may arise. Well written, and good front-page material. Thumbin'. Mrs. D. Christian Gauss Papillons. Neptune City, NJ: TFH Publications Inc, 1997.